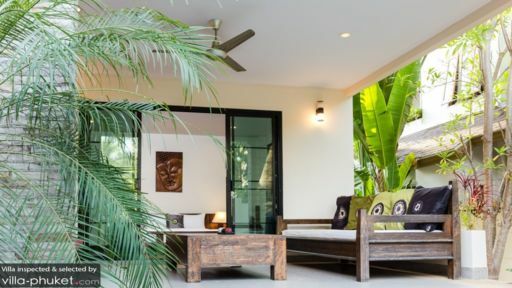 Combining the best of Thai and Balinese design elements, the beautiful Villa Salika features a beautifully landscaped outdoor compound, finely appointed living spaces and tastefully decorated bedrooms. Containing a total of four bedrooms, the villa is best suited for travelling parties of eight. Four bedrooms sleep eight guests at Villa Salika. Warm and inviting, each of the guest bedrooms features wood panel flooring, expansive glass sliding doors, oriental artworks, double beds and private en suites. The capacious master bedroom sets itself apart with a sun-soaked balcony, spacious dressing area and impeccably furnished en suite complete with a bathtub and twin vanities. You’ll want to spend most of your stay basking under the sun at the villa’s outdoor compound. The turquoise pool is framed by a wooden deck, where you’ll find a row of curved loungers looking out to the pool. 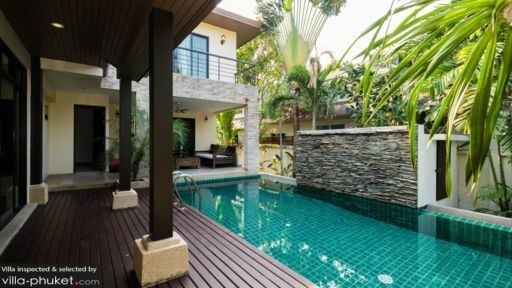 Take a dip in the sparkling pool waters or sunbathe out on the deck while the sun is out, and when the evening beckons you’ll want to linger by the poolside sipping glasses of your favourite sundowners. The living spaces at Villa Salika are spread out over two floors: the ground floor is where you’ll find the common area and guest bedrooms, while the generously proportioned master bedroom occupies the entire upper floor. Step past the glass sliding doors, and you’ll set sight on Villa Salika’s spacious, open plan living area. 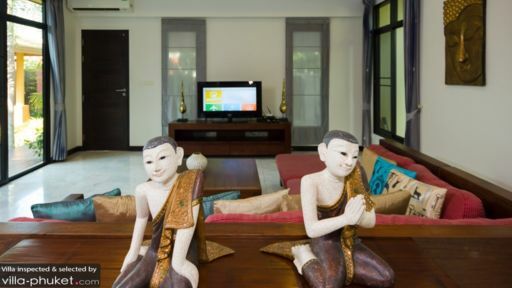 The indoor lounge is cosy and comfortable, with an L-shaped couch adorned with colourful cushions, a wooden coffee table, flatscreen TV and Asian ornaments. It extends out to include an eight seater dining table set under red hanging lamps, and an open kitchen outfitted with sleek black and white cabinets. Enjoy the serenity that comes with staying in peaceful Rawai, a village located at the southernmost part of Phuket. But this doesn’t mean that you’re placed far out of reach of travel attractions and activities - Laem Ka Beach is just a four-minute drive from your villa, and a variety of restaurants dishing out local and international fare are located within close proximity. Phuket Seashell Museum is a seven-minute drive from your villa, and if you’re looking to catch an unforgettable sunset show, popular sunset viewing spots - like Promthep Cape and Naiharn Beach - are a ten-minute ride away. Stocking up on necessities is easy and convenient with supermarket outlets like Makro Food and Tesco Lotus situated a three-minute ride from your doorstep.